A boost for your business and your bottom line. 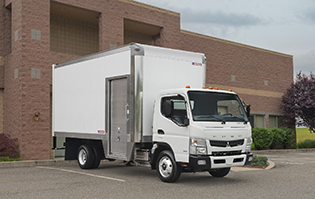 The Canter FE 160 will change the way you think about moving your company forward. Its cost-of-ownership is so low you can measure it by the mile—in dramatically improved fuel economy, service intervals, payload capacity and driver productivity. Its fuel-injected diesel engine and automated manual transmission set new benchmarks for efficiency and driving ease. They’re backed by our industry-best 5-Year/175,000-Mile powertrain limited warranty. The Canter FE160. It’s just the boost your business needs. 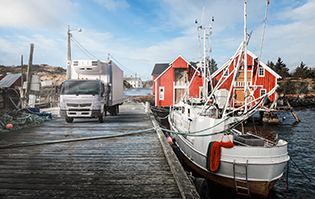 No matter what you deliver, the Canter FE160 will help you do it more dependably. At 15,995 GVWR, it’s a workhorse, right in the sweet spot of our medium-duty lineup. Comfortable enough for drivers of all shapes and sizes. Versatile enough to serve in any application from construction, industrial supply and landscaping to refrigerated transport. 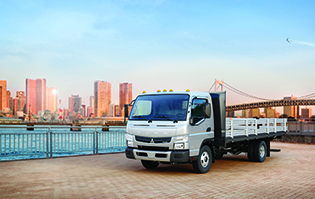 Its wide stance and compact, lighter diesel engine help contribute to responsive steering. Its flat, 33.5-inch wide frame makes for easier mounting of truck bodies up to 22 feet long. And it will carry more than a ton more payload than the leading cabover in its class. What a great way to move your business forward. The best part is the FE 160 comes with a 5-Year Powertrain warranty.